Dutch painter and printmaker. According to Houbraken, van Musscher received his eclectic artistic training in Amsterdam, studying first with the history painter Martinus Zaagmolen (c. 1620-69) in 1660, then with Abraham van den Tempel in 1661, followed by lessons with Gabriel Metsu in 1665. He completed his studies in 1667 in the studio of Adriaen van Ostade. 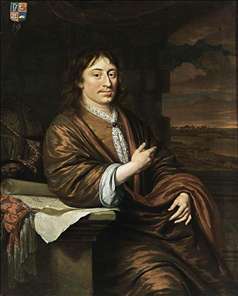 The following year van Musscher returned briefly to Rotterdam before settling permanently in Amsterdam in 1668. Van Musscher became one of the most successful portrait painters of the final quarter of the seventeenth century. He specialised in portraiture and the painting of genre pieces. 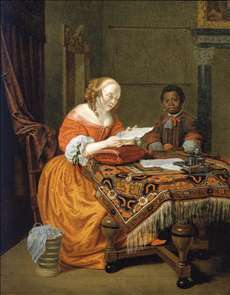 His style shows influences of his former master Gabriel Metsu and of Frans van Mieris. His technique is smooth and refined, but nonetheless freer and more robust than that of the fijnschilders of Leiden. Van Musscher is outstanding in the representation of fabrics. See more details about "Portrait of Gerard Pietersz. Hulft"
See more details about "A Young Girl at a Table"